It is important to highlight the awesome things our students and staff accomplish. This is recognition of our amazing Manawa community. We welcomed these professionals to the Manawa educational community. After 19+ years in urban education, Mrs. Christenson is coming to Manawa! She will be teaching choir and general music for grades 5 through 12. An interesting fact: She is the seventh child of thirteen! Mr. Joseph Christensen is new to Manawa Elementary School. He taught 6th grade in Racine, WI for 15 years, teaching mostly social studies. He enjoys watching sports of all kinds (especially the Packers) and is looking forward to an exciting year with the 6th graders at Manawa Elementary School. New London is where he resides. Mrs. Starry currently resides in Waupaca with her husband, four children, and their dog, Rex. In her free time, she enjoys photography, camping, and cooking. Ms. Arneson has been a nurse for 18 years. She has six children – 4 boys and 2 girls including a set of triplets. Nurse Arneson loves fishing and shed hunting. Katharine McArthur is in her 6th year of teaching. She has taught in Florida, Massachusetts and most recently in Oshkosh. This year she will be teaching Global Studies, World History, Economics, Sociology and Psychology. In June of 2013 Mrs. O’Brien left the district after 13 years working as a paraprofessional. From 2012-2016 Ms. O’Brien worked on a farm in a dairy parlor milking 180 cows. Ms. O’Brien then became a nanny. Ms. O’Brien enjoys working with students of all ages. 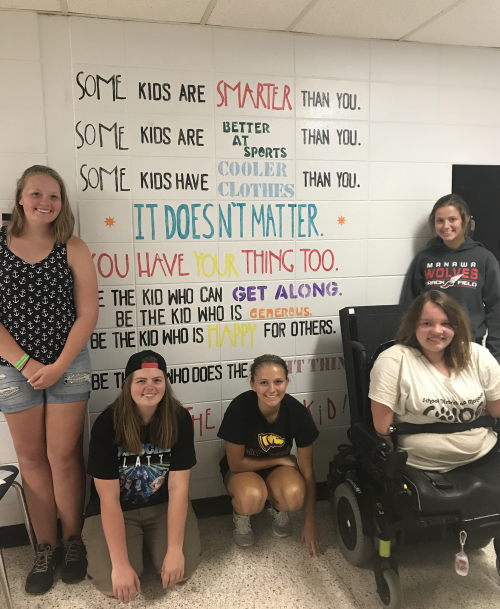 The Jr/Sr High’s kindness club, FOR Club, spent two days painting this positive message on the wall outside the teacher’s lounge. What a great group of kids and an awesome message for the incoming school year...and years to come. Chloe Lambrecht was recently recognized by the Manawa School Board for her excellence in FFA. Pictured with Lambrecht is Board President Joanne Johnson. Hunter Wendt was recently recognized for his excellence in FFA. Pictured with Wendt is Board President Joanne Johnson. 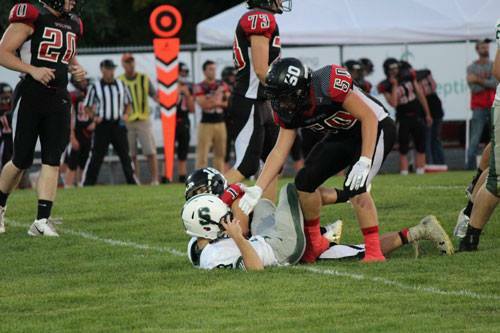 Ethan Wiesner shared a helping hand to a Shiocton player and showed us what sportsmanship looks like. INDIANAPOLIS (Monday, November 16, 2018) – The Manawa FFA chapter of Manawa, Wisconsin, has been recognized for top honors in the 2018 National Chapter Award Program. 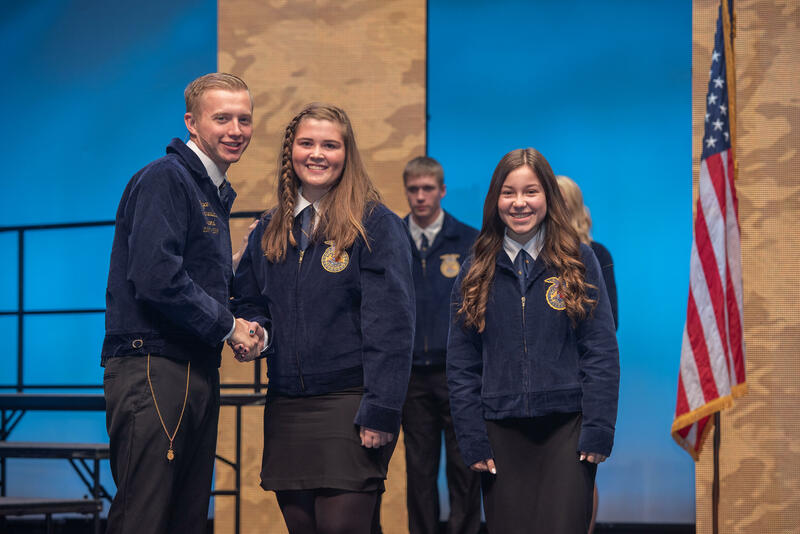 Callie Oltz and Chloe Lambrecht represented the chapter while receiving the award onstage at the National FFA Convention in Indianapolis, Indiana. 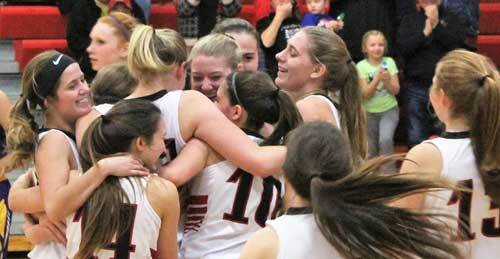 Laynie Bessette made basketball history when she scored her 1,000th point Dec. 6 during the Wolves’ 53-37 win over Tigerton.